Read more about Alternating. Direct. Shifting. AC / DC / IT on WRO Art Center website. 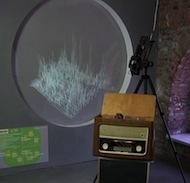 Read more about A Short History of Video Installations on WRO Art Center website. This site-specific installation, created for the WRO Art Center space, is based on Bruce Nauman’s classic 1970 work LIVE – Taped Video Corridor. Two side-by-side monitors show the same scene: the staircase leading to the gallery. Viewers soon realize that the two monitors show two different points in time: On one, we see an image of ourselves transmitted in real time; the other shows the same image with a brief delay, causing a sort of perceptual wobble. The installation represents a chapter in the history of media art in which numerous artists came up with startling space/time experiments. Specially for this installation, Paweł Janicki designed and programmed an original digital set-up imitating the functioning of the analog devices used in the 1970s to delay video signal circuits.